The Spotlight Shines on Dr. Courtney Lawrence! Dr. Courtney Lawrence is the Paul Ness Transfusion Medicine Fellow in the Pathology Department at Johns Hopkins Hospital. Hailing from Richmond, Virginia, Dr. Lawrence studied biochemistry and neuroscience at the University of Virginia while volunteering as an EMT and firefighter with the Seminole Trail Volunteer Fire Department. She relocated back to her hometown for medical school at Virginia Commonwealth University. She then completed a pediatric residency at Children’s Hospital of The King’s Daughters in Norfolk, Virginia, before moving to Washington, D.C., to complete a three-year fellowship in Pediatric Hematology/Oncology at Children’s National Medical Center. 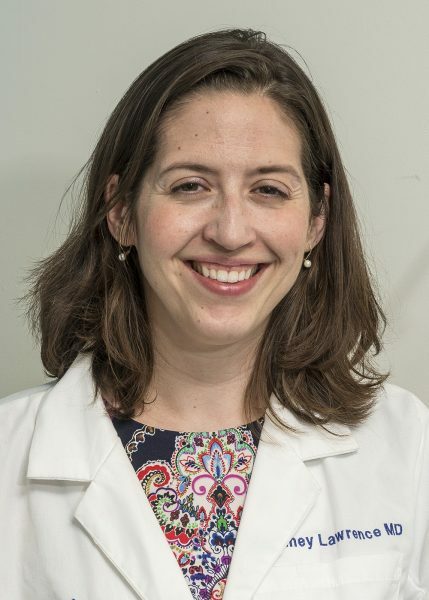 While at Children’s National, she earned a Master of Health Sciences in Clinical and Translational Research at George Washington University and studied the effect of exosomes from obese visceral adipose tissue on human platelets. Inspired by her benchwork with platelets and the clinical care of a large pediatric population with complex coagulopathies within the ICU at Children’s National, Courtney decided to pursue a fellowship in Transfusion Medicine at Johns Hopkins to better understand how blood product utilization plays a role in the management of patients with bleeding and thrombosis. Dr. Lawrence’s research at Johns Hopkins focuses on optimizing strategies for red cell exchange transfusions in patients with sickle cell disease. In her free time, Courtney enjoys treks to Patterson Park and the Baltimore waterfront with her husband and their tireless husky mix, Calaway. She is a big fan of both Mr. and Professor Trash Wheel (the water-wheel vessels that remove trash from the waterways of our region, including the Inner Harbor). She also enjoys gardening and visiting aquariums. The Spotlight Shines on Dr. Jennifer Bynum! The Spotlight Shines on Dr. Stefani Thomas!